It’s only fitting that one of the jewels of the New Pathways to Gold Society’s board has received a medal marking the Queen’s Diamond Jubilee. Director Lily Chow has been awarded the Queen’s Diamond Jubilee Medal in recognition of her community service, including her tireless work on the NPTGS board of directors. “It really came in as a big surprise to me when I received the news,” said Chow, who lives in Victoria but taught in Prince George for many years. Chow — an author, educator and historian — was awarded her medal and a certificate signed by Governor General David Johnston at a ceremony held in Croft Chapter House at the University of Toronto on June 23. 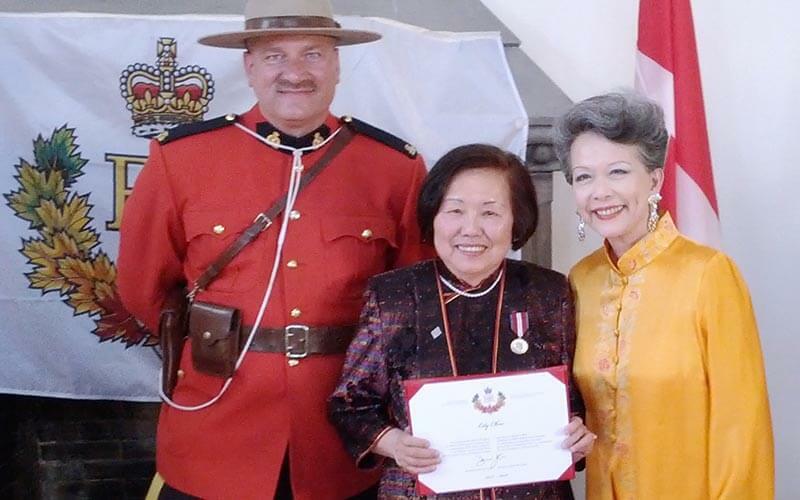 Some 27 other Canadians were recognized for their service at the ceremony hosted by Senator Poy, who toured the Lower Fraser Canyon along with Senator Lillian Quan Dyck as a guest of NPTGS in April. The citation accompanying the medal praised Chow’s decades of work in B.C. heritage — especially the Chinese-Canadian heritage she has documented and preserved. “For many decades, Ms. Lily Chow has contributed to her community as an author, a teacher, and most recently, on the Board of the New Pathways to Gold Society, a vehicle to sustain community legacies in heritage, economic, and First Nations reconciliation. Her interest in making history come alive, and her love of B.C., led to her involvement with the Society which aims to attract individuals to the B.C. interior by telling its stories, which include those of the Chinese Canadian pioneers who mined gold and built the CPR in the Fraser Valley,” reads the citation. NPTGS co-chairs Terry Raymond and Cheryl Chapman said Chow is a worthy recipient of the honour. Chow was born in Malaysia and lived in Canada since the 1960s. She taught in the Prince George School District and at the University of Northern British Columbia. Her first book, Sojourners in the North, won the Jeanne Clark Local History Award and is used as a textbook in many colleges and universities. This is the second Queen’s Medal Chow has received during her long and distinguished career. The first was in 2002, the year of Queen Elizabeth’s 50th Jubilee Anniversary celebrations. The Queen’s Diamond Jubilee Medal was created to commemorate the 60th anniversary of Queen Elizabeth’s accession to the throne in 1952. It pays tribute to citizens whose achievements have benefitted their fellow citizens, community and country.